Number 1 (Fighter) Squadron Association gets tweeting! It is with great sadness that I have to report to the Association the sudden death of our Patron, Air Chief Marshal Sir Peter Squire, GCB, DFC,AFC, DL, FRAeS, on 19th February. Following a distinguished career as a fighter pilot, Sir Peter was OC 1 (F) Squadron during the Falklands War, Station Commander of RAF Cottesmore and AOC 1 Group. Subsequently, he undertook a series of senior command and staff appointment before being appointed as Chief of the Air Staff from 2000 to 2003. In retirement he flew with the Air Experience Flight at Colerne. 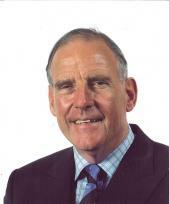 He was Chairman of the Board of Trustees of the Imperial War Museum from 2003 to 2011 and Vice-Chairman of the Board of the Commonwealth War Graves Commission from 2005 to 2008. He was also a Governor at King’s School, Bruton and a Deputy Lieutenant of Devon. Sir Peter, had been an outstanding Patron of the Association for many years and was an enthusiastic and wise counsel throughout his tenure. He was an inspiration to the next generation of fighter pilots through his patronage of the Association, and his warmth, support, professionalism and friendship will be sorely missed by all who knew and served with him. The Association expresses its deepest sympathy to Lady Carolyn and sons Christopher, Richard and Edward. A private family funeral will be followed by a memorial service in London.